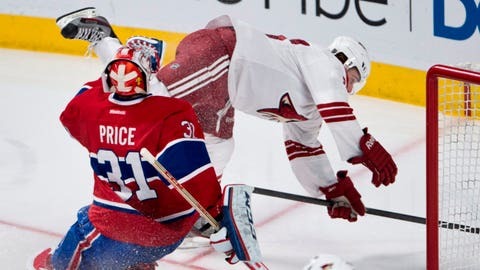 The Coyotes' Tim Kennedy flips over Canadiens goalie Carey Price during the third period Tuesday night in Montreal. MONTREAL — The Montreal Canadiens’ strong special teams paced their win over the Phoenix Coyotes. The Canadiens scored twice on the power play and killed off four minor penalties in their 3-1 victory over the Coyotes on Tuesday night. "Special teams are huge every game," said Andrei Markov, who tied the game 1-1 with the man advantage early in the third period. It was the first of three goals for the Canadiens in the final period. "If you kill a penalty, score a couple of goals, you have a chance to win the game." Montreal’s power play entered the game sixth in the league with a success rate of 21.5 percent. But the Canadiens’ special teams were slumping. They had only scored one power-play goal in their previous 21 opportunities. On Tuesday, Montreal was 2 for 4 with the man advantage. Markov scored the first after the Coyotes’ David Moss took a holding penalty at 2:01 of the third, and Max Pacioretty got the second with Oliver Ekman-Larsson penalized for delaying the game after batting the puck into the netting. Pacioretty’s 13th of the season was the winner, scored by shooting the puck into traffic in front of Mike Smith’s goal. The puck ricocheted off defenseman Michael Stone’s skate and into the net at 13:18. Coach Michel Therrien put Pacioretty’s line on the ice for every Canadiens power play. Montreal’s power forward finished the game with 4:03 of ice time with the man advantage. "When coach gives you that type of opportunity, you want to deliver," said Pacioretty, who also assisted on Markov’s goal. "Especially when things aren’t going how you want them to go, when he gives you an opportunity like that you want to prove that he’s making the right decision. "I think that was our motivation as a line to step up." Former Canadien Mike Ribeiro also looked to special teams for where his team struggled. The Coyotes were leading 1-0 before Moss headed to the penalty box. Our special teams didn’t create momentum, didn’t create much. They came back and scored. "We made mistakes, took some bad penalties," Ribeiro said. "Special units are part of the game, and if you can’t get them to click, oftentimes you’ll lose the game." Ribeiro pointed to a second-period power play as the difference in the game. With Phoenix still in the lead, Brandon Prust was called for roughing at 6:51 of the second. Prust turned the penalty into a four-minute double minor by saying something to the referee, and was penalized for unsportsmanlike conduct. But the Coyotes couldn’t muster much offence with the extra skater. "After that power play in which we didn’t create anything, they gained momentum," said Ribeiro, who made his eighth career appearance versus Montreal since being traded in 2006. "Our special teams didn’t create momentum, didn’t create much. They came back and scored." "It’s disappointing. It’s part of the game, but you can’t take that and be happy about it. You need to grind it out and be stronger." Mikkel Boedker got the Coyotes on the board at 6:14 of the first period, banking his own rebound off his skate and into the net for his 10th goal of the season. The Coyotes outshot the Canadiens 15-3 in the first and had another 12 attempts blocked by Montreal players. The Canadiens threatened the Phoenix net in the second, but still couldn’t put one past Smith. The home team came close to tying the game when Pacioretty fired a one-time shot off the crossbar late in the period. Montreal tied it to start the third when Markov beat Smith between the legs with a slap shot from the point. "As soon as Markov fired that one in, he didn’t show too much emotion," said Pacioretty of the game-tying goal. "But you know he’s fired up when he leans into a slap shot like that. It got the guys going a bit." After Pacioretty made it 2-1, he added an empty-netter to seal the victory. Carey Price stopped 26 of 27 shots for Montreal, while Smith made 25 saves for the Coyotes.